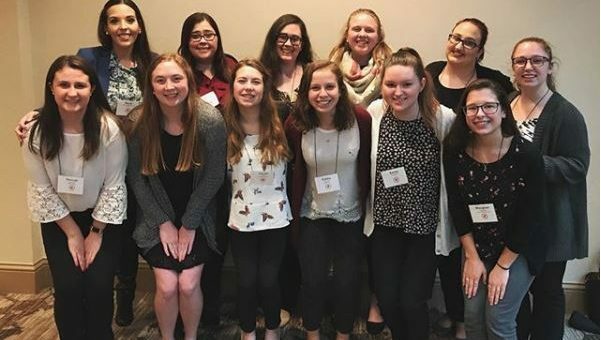 The Academy is Alpha Sigma Alpha’s day long regional leadership conference dedicated to providing collegiate members with opportunities for personal development and leadership training. Throughout the day attendees will be exposed to a variety of opportunities to connect with new sisters and engage in thought provoking discussions and educational sessions. Upon arriving, check in at the registration table and drop off any items collected for the local women’s shelter. Don’t forget to stop by the Alpha Sigma Alpha Foundation table to learn more about how to support the Foundation and join the 1901 Society. The Crimson Collections store will be open for attendees to shop the latest Alpha Sigma Alpha apparel. To start off the day, attendees will hear from keynote speaker Annalise Sinclair. Annalise will challenge everyone to think about why we spend so much time covering our flaws when what we present to the world is only a small fragment of who we really are. She will encourage everyone to go deeper than the surface as social media, advertisements and our own conceptions of “perfection” often lead us to portray ourselves in ways which mask our true identity. Annalise will teach attendees to love their flaws and achieve a deeper level of self-respect and authenticity. The rest of day will include over 20 different educational sessions that attendees can pick from. The Academy is all about growth and learning. Whether it’s personal or professional, the sessions offered at The Academy are sure to help attendees develop in different areas of their personal lives or as a chapter. Those looking to grow as leaders in their chapter should consider attending the sessions about risk management or the standards process. Attendees looking for personal growth can attend workshops focused on body positivity or identifying passions to live a purposeful life. Those looking to strengthen their connection to Alpha Sigma Alpha will love the workshop about incorporating The Ritual of Alpha Sigma Alpha into their daily lives. Throughout the day, attendees are encouraged to take advantage of opportunities to build relationships with the other sisters in attendance. Local alumnae, volunteers and friends of Alpha Sigma Alpha will be there to lead educational sessions. The Academy is a great place to get to know sisters from different chapters, cities and states. Taking advantage of this opportunity to meet new sisters can lead to impactful and long lasting relationships. The Academy offers something meaningful for everyone. Each activity and educational session can provide something to incorporate into life beyond college. While traveling back to chapters, attendees can bond with their sisters. Share everything that was learned, laugh about the memories made and know you have grown as a result of attending The Academy. Read about how a member’s experience at The Academy has changed her life.